The picture on the left is that of Massoud Behnoud, BBC Persian employee and the recipient of many grants and funds from European bodies. Throughout his entire life, Massoud Behnoud has switched sides and changed colours to remain close to whoever the ruling elite in Iran has been. This school drop out who used to flatter former Empress, Farah Pahlavi, when the Shah was in power, became a supporter of the revolution in 1979 and later a close associate of the Rafsanjanis and personal adviser to Mehdi Hashemi in London. The man, if thats the right word to use when referring to him, is an absolute disgrace in every way. Yet his boyish looks and his glasses coupled with his skill in story telling have made him the intellectual icon for many superficial Iranians who are struck by appearances and media celebrity status. I have heard Massoud Behnoud lie so many times through his teeth and twist facts as he pleases, but here I just want to mention one of his profound intellectual statements in a meeting I attended shortly before the 2009 disputed elections. 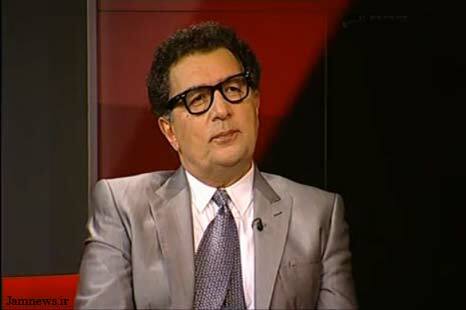 Behnoud who was one of the panel members speaking at SOAS, refuted any suggestions that the Islamic Republic would cheat in the elections and categorically stated "The Islamic Republic never cheats in elections". There you go, that's what the British tax payer is paying to keep in employment and Europeans are funding with their unaccountable and unmonitored grants. The reason I remembered that meeting and Behnoud's claim in the integrity of the Islamic Republic in counting votes was a report I came across yesterday in this Iranian news website about Rafsanjani's wife, Effat Mar'ashi. Effat is known by friend and foe to be a staunch steadfast woman, "worth ten men" often described by many who know her. The hardline Young Journalist Club, YJC, quoted her telling reporters that "My husband will not stand as an election candidate. There are no elections here. It is no bother for them to switch the votes"
So there you go, BBC Persian employee tells the public about the integrity of the Islamic Republic in counting votes and the wife of the head of the Expediency Council and former president of Iran believes elections in Iran is a farce. What an irony! Thanks for your grate informations, I am working on, ASIAN AFFAIRS MAGAZINE.